Mum Jinia Mridha with baby Alana, with Graham Wood and Julie Wilson. Mothers whose babies are being treated in the Special Nursery in Aberdeen received a “lovely” surprise yesterday courtesy of a local hotel. 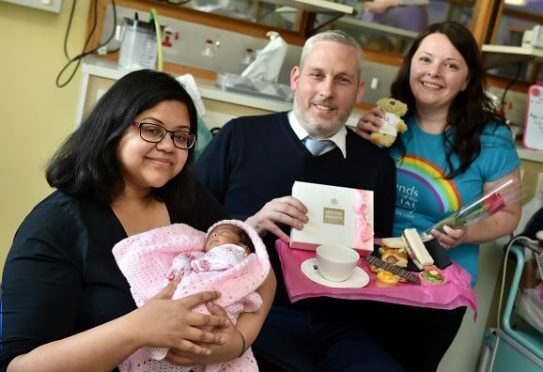 The Chester Hotel on Queen’s Road prepared 60 Mother’s Day afternoon tea-themed hampers to donate to the Friends of the Special Nursery, the official charity of the neonatal unit at Aberdeen’s Royal Infirmary. The hampers included a ready-made afternoon tea tray with sandwiches, cupcakes, éclairs, and a china cup for tea plus some Molten Brown hand creams and each box was topped-off with a fresh rose. The neonatal unit is for babies who are born too early or too sick to be able to go straight home and is currently looking after 26 babies. Friends of the special nursery charity worker Julie Wilson has also had experience of spending time in the unit visiting her daughter Isla who spent five months in the nurses care after she was born prematurely in 2010.